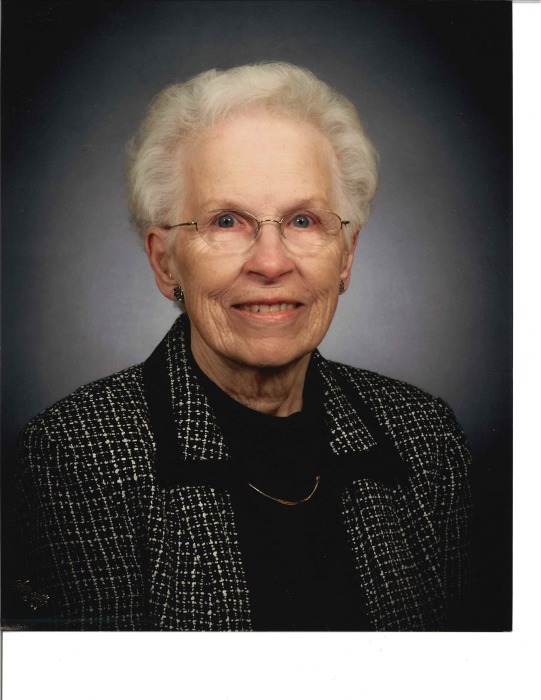 Arlys Virginia Deutsch, 91 of Chetek died peacefully Monday, March 25, 2019 at Atrium Post Acute Care in Chetek. She was born October 29, 1927 in Rice Lake, the firstborn daughter of Martha (Moen) and Edwin Knutson. Arlys attended Plainview Elementary School and graduated from Colfax High School. She married her high school sweetheart, Kennie Deutsch in Nevada 1947. The couple lived on Coronado Island in California while Kennie served in the United States Navy. They returned to Wisconsin and started their family in 1949. Over the next twelve years, she gave birth to five children; Vicki, Ginny, Larry, Kay and Mary. Together with her family, she enjoyed playing cards, camping and volunteering as a Girl Scout and 4H leader. Also, she worked alongside her husband at the Standard Oil gas station as a bookkeeper. Arlys embraced her faith as a Sunday school teacher, member of the Ridgeland Lutheran Church and member of the Chetek Lutheran congregation. Arlys will be remembered as a loving mother, dedicated grandmother and devoted wife. Arlys is survived by her children; Vicki (Bill) Tait, Ginny (Bill) Davis, Kay (Joe) Fostvedt, Mary (David) Thompson, grandchildren; Ryan (Stacy) Hayes, Billie Jo (Lauren) Davis, Jenica (Aaron) Paulson, Jacob (Stephanie) Fostvedt, Taressa (Bobby) Thompson, Dustin (Meghan) Thompson, Carrie Sutter, 19 great grandchildren, granddaughter-in-law; Stephanie Davis, brothers; Eugene (Eunice) Knutson, Dennis (Dixie) Knutson, sister-in-law; Dorrene Knutson, brother-in-law; Robert Anderson and other relatives and friends. She is preceded in death by her parents, husband; Kenneth, son; Larry Kenneth Deutsch, grandson; Stephen Lee Davis, brother; Curtis Knutson, sister; Louise Anderson. A memorial service will be held at 11:00 A.M. Saturday, March 30, 2019 at Chetek Lutheran Church with Pastor Guy Redfield officiating. Family and friends may gather one hour prior to the service for a visitation at the church. Inurnment will be held in the spring at Lake View Cemetery in Chetek.